1793 Large part cover showing on both sides fine impressions of the Serpentine BRISTOL in black. 1827 Entire to Wiveliscombe showing on the reverse a very fine boxed 'Bristol/P.P.' and on the front a boxed 'No 26 Receiver, BS142. 1827 Cover to Cirencester with, on the reverse, a very fine Bristol 'TOO LATE'. 1799 Entire to Olney, Bucks showing a very fine "BRISTOL/SEP 12 99", BS 47, FIRST YEAR. 1845 and 1846 1d Pink envelopes showing three-line BRISTOL/DATE/PY. POST IN BLACK AND GREEN. A Pair. 1674 Entire from BRISTOL addressed "These ffor Mr Thomas at Sr Robt Claytons in the Old Jewry London" showing an 'OC/7' London Bishop mark. Double Rate '6'. 1856 Envelope from Bristol to Bewdley with, on the reverse, a fine FRAMPTON-COTTERELL undated circle. 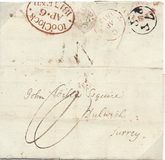 1846 Wrapper addresesed to London from Bristol showing on the reverse a fine STOKES-CROFT Undated Circle. 1796 Entire addressed to "Sandhurst, Near Dorking, Surry"with, on the front, a fine straight line BRISTOL, BS 38 - crossbar of 'T' 5mm. 1764 Entire addressed to the "Hot Wells, Bristol" and showing a very fine "B/RIS/TOL" in black, BS 18. 1813 Entire addressed to Dulwich showing on the reverse a very fine BRISTOL circular framed 7/P P/P in black, BS 132. Very Fine and Scarce. Circa 1740 Cover to London showing on the reverse a fine BRISTOL "B/RIS/TOL", BS 12 and London Bishop mark for 21/FE. 1824 Entire from Clifton to St Colomb, Cornwall showing a very fine boxed BRISTOL/PY. P., BS 140. 1831 Entire to Bourton with, on the reverse, a very fine boxed BRISTOL/18MY 1831/PY POST, BS 148. Scarce. 1841 Emtire from New York to Halifax showing a SUPERB two-line BRISTOL/SHIP LETTER IN BRIGHT VERMILION, Robs S8. 1822 Entire to Chepstow with, on the reverse, a very fine DOTTED CIRCULAR-FRAMED BRISTOL/122 MILEAGE, BS 83. 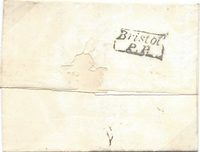 1870 1d ROSE-RED, SG 43, PLATE 132, vertical strip of Five tied to Registered envelope locally in Bristol by a very fine BRISTOL/134 duplex - Undelivered due to "Insufficient Address GB". THE SCARCE PLATE 132. Superb. 1772 Fragile Entire from Jamaica to London "BY THE MOLLY CAPt ALEXANDER" SHOWING A VERY FINE BRISTOL/SHIP LETTER, Robs S2.